When you choose to work with Only One Remote you can expect to get more than just a remote programming service. By taking advantage of all we have to offer you will discover how central the remote control can be to enhancing your overall sales. Contact us for information about the dealer demo program and find out how it can help your business in ways you never thought possible. If you turn to us for your programming needs, you will be working with the leading professional remote programming company in the industry. Only One Remote has been producing remote configurations for nearly a decade for both end users and dealers. Customers today are looking for more than just a great home entertainment system at a fair price they are also concerned about ease of use. Today's new technologies are making it tougher than ever for the customer to find a control solution that is simple and intuitive to use. When they hire a custom professional to install their new equipment they are expecting the system to include a remote that everyone in the family will be able to use. More than ever, running a successful custom operation today means managing your time wisely. Remote programming is very time intensive; you must either learn to do it yourself or hire a programmer. Using Only One Remote, you can submit your orders online 24/7. Then in a week to seven days you’ll receive a message informing you that your customer’s configuration is ready. You can then download the file into the remote and you are ready to test! Our tech support features an important difference. If you need tech support at the jobsite, O1R is standing by with a copy of your file locally on hand to help you troubleshoot. The difference is that we are looking at the same file with you in real time which will dramatically reduce the time it takes to isolate the problem and get the project finished! We also offer system design consultation. When putting together proposals for your customers there are times when it’s good to be able to consult with someone who knows a particular product you are about to recommend. When you need advice about the control aspects of a device you have never used, it can sometimes be difficult to find accurate answers. As one of our dealers, you can pick up the phone and give us a call. We too are eager to know that we are going to be able to provide you with a reliable control solution and since we deal with a very wide range of products we may be able to answer your questions or recommend a product that may be better suited in a particular application. We have to consult owner manuals on a daily basis and have an extensive code database that we have been compiling and testing over the years. We can usually let you know if there are particular discrete codes available to control a specific product. We can help you enhance your company’s image. Only One Remote will deliver a polished and personalized end product built for the specific system and end user with same consistent yet distinctive quality every time. As you can see from the examples page, all of our graphics are produced in house to insure that we are setting you apart from your competition! Remember, the customer is using the remote every time they operate the system and your company’s reputation is on the line every time they press a button. If the remote is flawless- so are you! 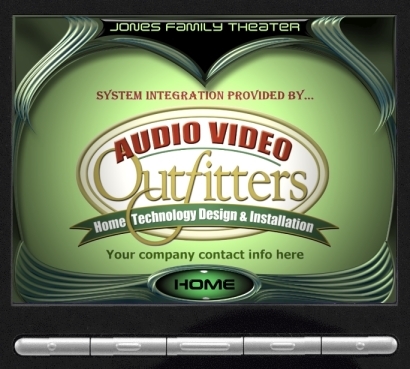 With each remote configuration we include a dealer ad page like the one shown below which will contain your company name and logo. If you do not have graphics available we can design an ad page for you. There are several additional special features that we build into our configurations. Contact us for more details. The dealer section of our website contains many useful dealer specific tools including system design tips that discuss many subjects related to automating systems and “best practice” information on system setup. These are lessons we have learned with experience and are intended to help you work more efficiently. Contact us today to learn more about how we can help you take your business to the next level!